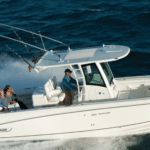 With the 280 Outrage, Boston Whaler redefine versatility and comfort. A Boston Whaler rental has never seemed so appealing, and this boat is sure to be in high demand this season. The 280 Outrage showcases plenty of design innovations. Central to this is the 23 degree dead rise, resulting in phenomenal handling and the ability to masterfully cope with rough waters. There is also less bow rise upon acceleration, adding to the comfort and driving pleasure. The two 300 HP Mercury Verado outboard engines ensure that this Boston whaler rental is powerful and quick. Cruising speed is 25 knots, and an impressive top speed of 49 knots can be reached. The combination of a redesigned hull and powerful engines makes this boat pleasantly light and agile. The comfort of the guests has been carefully considered with the 280 Outrage. Features such as a fridge, sink, table, deck shower and toilet (with 5’5 of headroom) ensure that comfort is maintained. Furthermore, a covered swimming later and grab rail allow you to enjoy the warm Med waters. Seating on-board is intelligent and comfortable, with a total of 13 guests and skipper comfortably cruising on this Boston Whaler rental boat. Traditionally designed as a fishing boat, the Boston Whaler has plenty of storage space designed for rods and tackle. She is the perfect fishing boat to rent in Golfe Juan. A popular day boat and superyacht tender also, thanks to her performance and comfort.